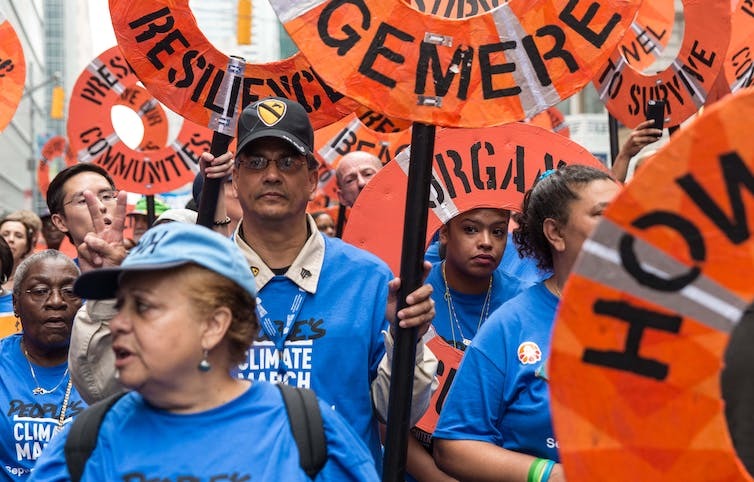 The 2014 People’s Climate March in New York City. Organizers have worked for over a year to build an intersectional movement that brings together diverse constituencies under the banner of climate justice. They hope to replicate the first People’s Climate March in September 2014, which was the largest climate change mobilization in history. 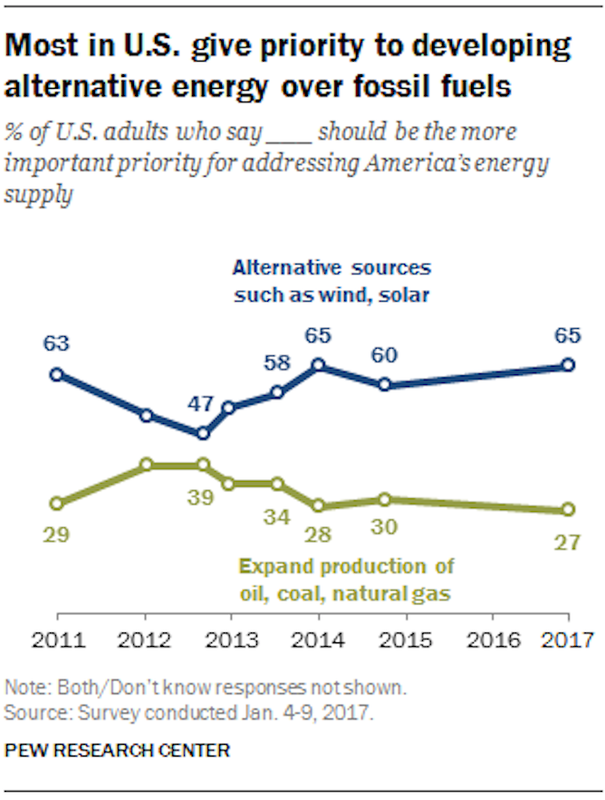 But surveys show that only about one in five adults in the United States is alarmed about climate change. This means that if climate activists want this march to have a lasting impact, they need to think carefully about how to reach beyond their base. Alarmed, dismissive or somewhere in between? Yale Program on Climate Change Communication. However, there is room for this base to grow. In survey research after the November election, the researchers found that nearly half of Trump voters thought that climate change was occurring and the United States should participate in the Paris Agreement. Another 21 percent was unsure whether global warming was occurring. Only 30 percent believed that it was not happening. The takeaway is that approximately seven in 10 Trump voters may be reachable on climate issues – but march organizers need to consider how to engage them. Social activists have used internet-mediated “days of action” as a tactic since the global justice movement and demonstrations that shook a Seattle World Trade Organization gathering in 1999. These mobilizations allow activists to amplify their demands while seeking mainstream media attention, which is still a movement goal in the social media era. Social media applications allow fluid organizing structures, which scholars have termed “connective action.” Organizers amplify these digital media-enabled protests by spreading personalized messages, or action frames. Social movement organizations such as the People’s Climate March seed these messages, which individuals spread through their own preexisting social networks. My research on Global Frackdown, a day of action against hydraulic fracturing in October 2013, found that activists used Twitter to connect participants across local protests taking place in multiple countries. But Twitter served more as an identity-building space than as a way to reach external audiences. Moreover, digital media are tools – and the PCM appears to be using them mainly to mobilize people who are already engaged in climate activism. In the lead-up to this year’s march, the main Twitter account has focused on mobilizing messages, including resistance against Trump, environmental justice and “frontline” communities most impacted by climate change. The account has also shared calls to join the march, which are framed around a diverse group of participants telling individual stories about why they plan to participate. The organizing website’s section on social media includes sample messages with mentions of clean energy and a “historic resistance” to the Trump administration. The sample visuals all include protest imagery. A set of videos, recently released by the climate change advocacy group 350.org on YouTube, feature climate scientist and evangelical Christian Katharine Hayhoe, along with activist Bill McKibben, actress Maggie Gyllenhaal, climate scientist and activist James Hansen and Mustafa Ali, former head of the Environmental Protection Agency’s environmental justice program, explaining climate science and solutions. Other than Hayhoe, who has worked very hard as a bridge builder, these are all very progressive figures who might not be the best communicators to reach beyond core supporters. In my view, organizers are using these platforms to mobilize the activist base, rather than to reach out beyond those already most alarmed about climate change. But there’s a risk in this strategy. They should keep in mind that even among the alarmed, only about half identify as liberal. Focusing on resisting Trump could risk alienating otherwise potentially sympathetic individuals. Research shows that climate change messaging strategies need to take into account varying psychological and social factors that underpin Americans’ beliefs about climate. For “alarmed” and “concerned” audiences with high issue involvement, messaging should focus on sound arguments for climate action, along with personal and collective efficacy to address climate change. Alarmed individuals can also be tapped to act as “opinion leaders” in talking about climate issues with family and friends. For “cautious” and “disengaged” audiences, personalized messaging with visuals and humor that promotes positive social norms and shows climate-friendly behaviors as widespread will be most effective. But PCM activists are not communicating in a way that will effectively reach nonalarmed segments of the U.S. public. 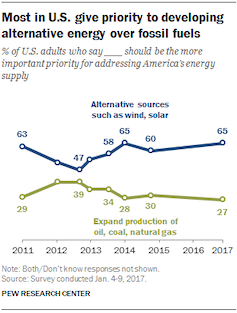 They would attract more support by paying greater attention to bridging issues, such as clean energy, which is supported by individuals across the political spectrum. Furthermore, the U.K.-based nonprofit Climate Outreach suggests using visuals that show climate change causes and impacts at scale, as well as depicting climate impacts along with solutions. They recommend careful use of protest imagery because most people don’t identify with these types of visuals. Climate organizers may benefit from heightened levels of progressive activism under President Trump. But many other interest groups, including scientists, immigrants and gay rights groups, are also organizing public protests. If large-scale marches start to produce diminishing returns, activists will have to develop other tactics.